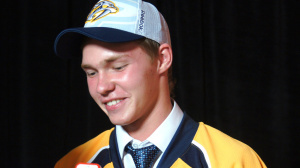 Of four Nashville Predators prospects at the 2015 World Junior Championship, the only to medal was Russia’s Vladislav Kamenev. Russia fell to Canada 5-4 in the gold medal match, despite an incredible comeback from down 5-1 a little over halfway through the second period. Kamenev, a 2014 second round pick, helped in the comeback efforts with an assist. In 7 games total, Kamenev posted 1 goal, 3 assists. One of the most disappointing performances of this tournament came from Finland’s goaltender Juuse Saros. The Predators’ 2013 4th round pick was expected to lead Finland to another medal winning performance after winning gold in 2014. Instead, Saros struggled, and Ville Husso emerged as Finland’s starter entering the quarterfinals. Finland lost to their Scandinavian rival Sweden 6-3. Saros, 5-foot-11, 176-pounds, went winless in two starts with a 3.03 goals against average and .875 save percentage. Last year, he was named on the media all-star team for going 5-1-0 with a 1.57 GAA and .943 save percentage. Fellow Finn and defenseman Joonas Lyytinen had an assist and a +3 rating in 5 games. Lyytinen, 6-foot-1, 165-pounds, was drafted in the 5th round in 2014. A Kevin Fiala led Switzerland team struggled in the preliminary round and narrowly avoided regulation from the World Junior Championship. After impressively defeating Czech Republic 5-2 in Switzerland’s opening game of the tournament, they lost the next three — 7-0 against Russia, 4-3 in a shootout to Denmark and 5-1 against Sweden. Finishing last in Group B, Switzerland took on Germany, who did not win a game all tournament. Switzerland won the best-of-3 against Germany in two games, 5-2 being the score in both games. Nashville’s 2014 11th overall pick totaled 4 goals, 1 assist and 16 penalty minutes in 6 games for the Swiss.